Fit our Better-than-Ever Cheesy Meat Lasagna into a healthful eating plan. 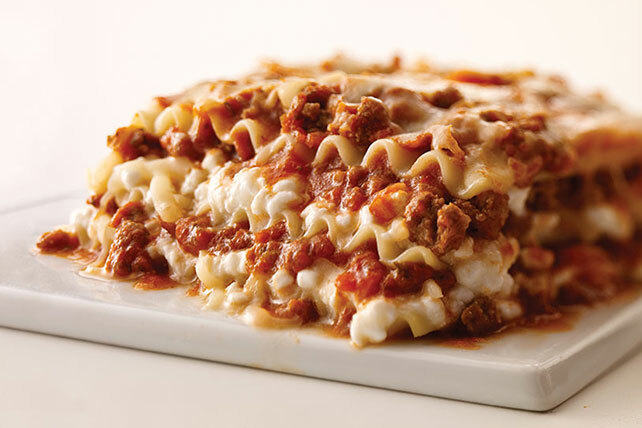 This cheesy meat lasagna is made with cottage cheese, ground beef and pasta sauce. Brown meat with garlic and oregano in large saucepan. Stir in pasta sauce; simmer on medium-low heat 5 min., stirring occasionally. Remove from heat; stir in tomatoes. Mix egg, cottage cheese and Parmesan until blended. Spread 1/2 cup pasta sauce mixture onto bottom of 13x9-inch baking dish sprayed with cooking spray. Top with layers of 3 noodles, half the cottage cheese mixture, 1/2 cup mozzarella and 1 cup of the remaining pasta sauce mixture; repeat layers. Top with remaining noodles and pasta sauce mixture; cover. Bake 30 min. or until heated through. Top with remaining mozzarella; bake, uncovered, 5 min. or until melted. Let stand 5 min. before serving. We've made over a traditional lasagna that results in a savings of 140 calories and 11g of total fat, including 5.5g of sat fat, per serving by using extra-lean ground beef instead of sausage and decreasing the amount, using cottage cheese instead of ricotta cheese, decreasing the Parmesan and using KRAFT 2% Milk Shredded Mozzarella Cheese. Substitute 1 container (15 oz.) part-skim ricotta cheese for the cottage cheese. Assemble lasagna as directed. Refrigerate up to 24 hours. When ready to serve, bake, covered, in 375°F oven 40 min. or until heated through. Substitute 2 cups frozen BOCA Ground Crumbles for the browned ground beef. Add to pasta sauce in saucepan along with the garlic and oregano; cook until heated through, stirring occasionally. Continue as directed.